Forty years after The Sussex Manifesto helped shape modern thinking on science and technology for development, the STEPS Centre and its partners around the world have created a new manifesto recommending new ways of linking science and innovation to development for a more sustainable, equitable and resilient future in an era of dynamic change. 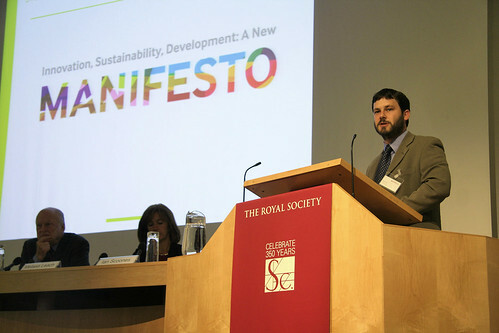 The launch of Innovation, Sustainability, Development: A New Manifesto was held at the Royal Society in London on 15 June 2010. Video from the launch is also available. The Manifesto launch was co-supported by UKIERI. We live in a time of unprecedented advances in science and technology. The world is ever more globalised and interconnected. Yet poverty is deepening, the environment is in crisis and progress towards the Millennium Development Goals has stalled. Meeting the interlinked global challenges of poverty reduction, social justice and environmental sustainability is the great moral and political imperative of our age. Science, technology and innovation of many kinds have essential roles to play in this. But along with many others, the STEPS Centre believes that this imperative can only be fulfilled if there is a radical shift in how we think about and perform innovation. We need a new politics of innovation. Such a shift is possible, and in inspirational initiatives around the world, it is underway. Innovation, Sustainability, Development: A New Manifesto intends to provoke more vibrant and explicitly political debate and to catalyse action. The ESRC STEPS Centre (Social, Technological and Environmental Pathways to Sustainability) is an interdisciplinary global research and policy engagement hub uniting development studies with science and technology studies. What is ‘Innovation, Sustainability, Development: A New Manifesto’? In 1970 the publication of a radical and controversial document helped shape modern thinking on science and technology for development. It was called The Sussex Manifesto: Science and Technology to Developing Countries during the Second Development Decade. Why is a New Manifesto needed now? Standard policies link innovation, science and technology to development in ways that are not always the most sustainable and equitable solutions for the people they seek to help. As a result, they often fail to address the challenges of an uncertain, dynamic and rapidly changing world. Innovation, Sustainability, Development: A New Manifesto aims to challenge the mainstream models of science and technology for development that have become integral to government and international agency policy.